Designing your garden from scratch? Or just want to give your current garden a boost? Creating a new garden design can give your entire home a boost – in summer you'll have a whole extra outdoor room to enjoy; in winter, you'll be able to enjoy the views of the newly revamped plot from inside. Need to know how to design a garden to get it just right for you? Don't make a start until you've read our expert step-by-step guide – it will save you time, money and elbow grease. Then check out our garden hub page for lots more advice, hints and tips. Establishing a design brief for your garden project should be the first stage of the process, and is essential whether you intend to employ a professional garden designer or complete the work yourself. You will need an understanding of all the problems that need to be solved and all the goals you want to achieve with your garden project. Spend time discussing why you’re undertaking the project before capturing this in a set of design aims; these can then be developed and a list of requirements drawn up. Statements in the brief should always be measurable (this is essential when working with others) and specific, to avoid ambiguity. For example, ‘formal dining space for six people with shade overhead between June and September’ is far better than ‘space to sit and dine with friends’. Note that parts of the brief might change, but you still need one, otherwise the project will lack clarity and inevitably cost more than planned. If you’re working with a designer, the brief should be developed together before being agreed. Avoid requesting specific design details – ‘decking’, for example – at the outset. Instead, descriptive words such as ‘durable’, or ‘warm’ will evoke a more creative response – the reason you probably engaged the designer in the first place. Should you hire a garden designer? 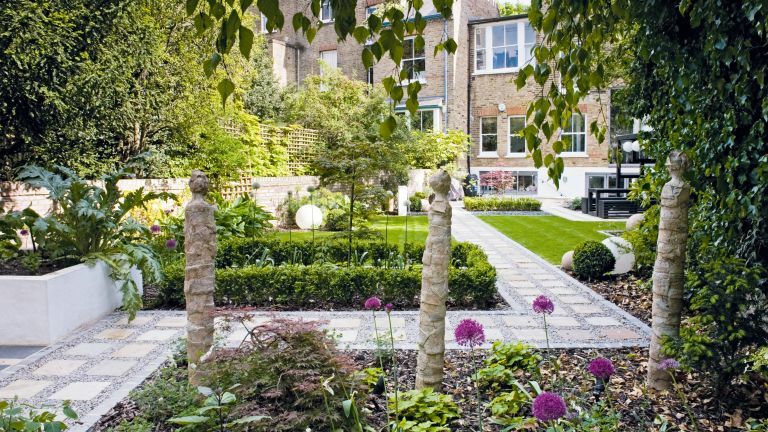 Many people view professional fees with scepticism, but if you’ve never undertaken a large garden project before, or don’t have experienced friends or family to call on, consider hiring a garden designer. They will help in all areas of your project, and can save you money in the long run. Many gardens are remodelled at the same time as renovating a property, and a good designer will liaise with your architect and main contractor to help make sure the combined project runs smoothly. If your budget prohibits taking on a designer, at the very least consider a day’s consultancy to help steer you in the right direction (from £275-£750 per day). Should you DIY or hire a garden landscaper? Typically, labour costs amount to 50 to 60 per cent of a project’s costs, so, with a £10,000 budget – typical for urban gardens – that leaves £4,000 for clearance work and skip hire, design fees (around £1,500), specialist consultant fees, if necessary, and materials. Know your limits. Planting, installing off-the-peg water features, laying a new gravel path or lawn, and installing your own deck and fencing are within the scope of the keen amateur; however, walling, laying expensive stone pavers, concrete rendering and electrical work should be carried out by professionals for a quality, safe finish. To find out information on materials, use manufacturers’ price lists. Builders’ merchants and plant nurseries are also useful sources. You can usually negotiate good prices direct from the supplier or manufacturer, depending on the quantities. Spon’s External Works and Landscape Price Book is helpful to consult, and is the most common guide used in the trade. When it comes to costing labour, most landscape contractors will readily give you an hourly or daily charge-out rate, as well as an estimate as to how long jobs might take. For the cost of machinery and plant hire, ask local reputable hire companies to provide daily and weekly prices. While knowing the individual costs of materials and plants is useful, what you should be most interested in is an ‘all-in rate’ – the complete cost for a particular part of the job, including labour and all materials. This rate will differ depending on the contractor and also the size of the company (the larger the company, the higher the rate). Site overheads and profit aren’t listed, so your best bet is to ask experienced contractors who can advise and could quote for the work in advance. Contractors that are affiliated to either the British Association of Landscape Industries (BALI) or the Association of Professional Landscapers (APL) should be your first choice. How much do you have to spend? Creating a new-look garden can be very expensive, especially when it comes to contemporary design, where a clean finish is essential. Other high-cost practices include the desire for instant impact, complex shapes and curves; requirements for extreme accuracy; fixed design details with no ability to adapt on site; and hiring specialist tradespeople that have to travel some distance. Moving underground services, drainage works, demolition and site clearance work will also add to the cost, especially if access is tricky or there’s a need to work by hand. If your budget is tight and you are looking to save money on your garden design, avoid these choices and go for high-impact, low-cost design solutions. Reclaimed and recycled materials generally cost less than new, while ‘fluid’ materials, such as gravel, are cheaper than paving. You should also opt for plants over hardscape. In many gardens, it’s possible to cover or clad rather than remove – a sound concrete pad, for example, might be the ideal sub-base for attractive paving. Check out our guide to exterior cladding and render to learn more. Always have a contingency fund. Between 5 to 15 per cent of the total budget is ideal, but the higher the better, especially if you are tackling the project yourself. While savings will be made in some areas, inevitably you will make mistakes in others. How long will a garden redesign take? Not everything needs to be completed at once, and with a tight budget it’s unlikely that it will be. Instead, phase the project, completing elements from the masterplan when finances are available. Unfortunately, the most important parts, which need finishing first, are usually the most costly. These include building retaining walls, steps and ramps, boundaries, patios and terraces, and paths. Semi-mature specimen plants to screen nosy neighbours are also costly. Tempting as it may be, leave design details such as ornamental planting, pots and furniture until after the bones of the garden have been completed. Think about the seasons, too. Most gardening and landscaping work is carried out between spring and early autumn, when nights are shorter and the weather is warm. The best planting season is early- to-mid spring and early-to-mid autumn. All this needs to be factored into your timeframe. Good contractors will get booked up early, so the quicker you start to develop the actual design, the better. Does your garden design require planning permission? For most garden projects, it isn’t necessary to apply for planning permission, but you will need to in certain cases – extending boundary heights, extensive terracing, decking platforms above 30cm and new paving in the front garden being the most common examples. If you live in a conservation area then the rules can vary wildly, so always check with your local authority. Usefully, new plants and trees aren’t covered by planning permission, although existing trees may have a Tree Preservation Order to protect them. Contact your local authority to find out. If you are working on an existing party wall or directly next to a boundary, the Party Wall Act is likely to apply. For detailed information, visit planningportal.co.uk. Details of the allowable height and size of garden structures, such as new outdoor home offices, can also be found here. The RHS Encyclopedia of Garden Design, RHS The Urban Gardener, Heidi Howcroft’s Garden Design: A Book of Ideas and John Brookes’ legendary Small Garden Book will all help you to develop ideas with your wants and needs in mind. Magazines are also good for inspiration, and specialist ones keep up with key trends at important flower shows, like Chelsea and Hampton Court – useful if you can’t visit in person. Go to public gardens that are part of large estates and country homes to see materials and planting combinations. Better still, seek out local plots of a similar size to your own that open as part of the National Gardens Scheme (NGS). You’ll discover everything from traditional cottage gardens to contemporary courtyards. Find them in the NGS Yellow Book. While a complete makeover often results in a more coherent outcome, it can be very expensive and demanding of time. Making subtle tweaks inevitably costs less, but this approach has more limited scope. Spend time looking critically at the garden and both its good and bad points before developing a new ‘masterplan’, and certainly before you carry out any of the work. Perhaps you’ll want decrepit garden pools to be removed, but other features, such as an attractive patio or mature trees, to remain. Specific wants and needs vary from person to person, but ask yourself, ‘how do I want to feel?’ and ‘who is the garden for?’ Also consider how much time you have for maintenance. Together with a particular style or theme in mind, the answers will determine the layout and design details. Consult everyone who has a stake in the project, including children. Inevitably some compromise is usually necessary, especially if the space is small or access is difficult. See our garden maintenance checklist for an idea of what's involved year-round. Identifying and exploring potential materials is one of the fun bits of creating a garden. When it comes to choosing paving for your new patio there are lots of options available – from expensive York stone to concrete imitations. While performance, durability and ease of maintenance are key with all materials used in a garden setting, you should choose natural-looking surfaces that complement your home and design style. Earthy greys, deep honey browns and rustic dull reds suit both old and new houses. To successfully link your indoor and outdoor spaces, choose a similar material to that used in the room linked to the garden – just make sure it’s weatherproof. Decking is a good choice where wooden flooring is used inside the house. However, this does not suit period architecture. Softwood decking might be cheaper, but doesn’t weather as well or last nearly as long as hardwoods, such as ipe and balau. Choose different hard landscaping and floor surfaces to differentiate between the dining, lounging and play areas. Obvious options include a stone material for the dining space, decking for the lounging area, and bark or grass for the play area. Use different colours on fencing or walls to create separate zones. White is a good backdrop for lounging areas that you want to feel bright and sunny, deep greens are good for making play areas blend into the background, while deep shades, such as blue or aubergine, make dining areas feel atmospheric during long summer evenings. Plants can help define zones too, especially if you go for a strong colour theme by area. So, if your lounging space has a white wall behind it and light-coloured decking, choose white flowers. If your dining space has dark-coloured decking and aubergine walls, go for deep purple plants. Architectural planting can be used to divide up zones. A line of shapely box plants, set into a low wall, takes up very little space but creates a strong visual divide between the lounging and dining areas. Or, group tall, tropical-looking plants at the far end of a dining space to disguise a play area beyond. Consider growing a vertical garden: Garden Beet sells modular planters that allow you to create a ‘living’ wall. Don’t neglect vertical space: screens, arbours, pergolas and trellis all provide privacy and somewhere to train flowering climbers for visual interest. Paint them to match your scheme; or, if you want your planting to do the talking, choose a neutral, natural paint shade for them, such as olive green or pale grey. Will you be installing a water feature? If you are installing a water feature, you will need to make plans for this early on. If you are phasing your design – perhaps doing a patio first and moving on to other features as budget allows – then make sure you won't have to undo hard work to retrofit pipe work. Style guide: A water feature is a focal point. Rivulets over a reclaimed millstone flatter a traditional scheme. Brimming powder-coated steel tanks or spillways suit modern gardens. Integrated or off-the-peg? : Store-bought features or natural pools are easy to install yourself. Bespoke features, especially those integrated into paving or walls, need an experienced contractor – which will cost more. Size: Natural wildlife pools are appealing but need to be big. In a tighter space, a smaller formal feature works best. Consider the height and strength of fountains and spillways, as powerful pumps can be loud in small spaces. Edge details: Hide pond liners. For natural settings, create a ‘soft edge’ with plants and strips of turf flipped on their backs. With formal features, such as thin rills or channels, have paving with a crisp edge overhanging it. Wildlife magnet: Attract ‘guests’ with a natural pool. Ideally, it must be at least 50cm deep and on a level site. A semi-shady spot away from deciduous trees minimises algae. Include plants in the water and on the fringes. Safety first: With young children, avoid even shallow water. Wall-mounted or freestanding features with an underground reservoir are best. Fence off existing pools or fit pond grids (try pondsafety.com) just below the surface. Need more advice? Find out everything you need to know about garden water features in our guide. Well positioned lighting can completely transform your garden space at night, so planning your outdoor lighting is something to give proper thought. Think about what kind of an atmosphere you'd like to create and choose your outdoor lighting accordingly. Perhaps you like the relaxed, boho vibe that is easily achieved by hanging some festoon lights and accessorising with tea lights and lanterns? Or do you prefer something elegant and permanent, such as a pendant or porch light? If security is a concern, you may want to think about flood lights. Last but not least, the colouring and strength of your lights will contribute to the overall effect. If you've got very young children, it's worth planning the layout of your garden and choosing hard landscaping, surfaces, plants and play structures to create a child-friendly garden that not only suits your family now, but will be future-proofed, too. If you love dining in your garden on every possible occasion and prefer food cooked outside as well, why not create a fully equipped kitchen outside your home that allows you to cook in different ways, plus has preparation and plating-up space, as well as super-useful features like sinks, fridges and lighting? See our feature on creating an outdoor kitchen to find out how.